July 2001 – the date that changed by life. I had just graduated from Pharmacy School and did not have a job. I did not know what to do. One day I received a phone call letting me know about a job opportunity and shortly after, I found myself in an interview with Tracy Pierce Bender. I was so nervous; I could read English, but I could not speak very well. The interview was upbeat and relaxed, as if we all had known each other forever. After the interview, I knew I really wanted this job; I really wanted to work. That afternoon I found out I was hired and became a part of the Cristi’s Outreach Foundation. It was the best news I had received. The next day the training started. During my training week, I could not wait for the evening to be over so that it would be morning and I would go back to my job. After one week of training, I began to work with children. The first day was difficult. I felt bad for the children and was unsure that I was doing the right thing. I went home and cried, asking myself why these children have to suffer so much and why I had to experience this suffering. Until that point, I had seen a different world, a world with no problems; but that was not the reality. I wondered if I should give up or if I should continue. It felt like a really bad dream from which I wanted to wake up. And then suddenly, the images of the children I had worked with during training popped into my head; the children that would rather spin the wheels of a toy car endlessly than play with it because they did not know how to play. I realized that I should do something about this, that I should teach them how to play with toys. It was then that teaching children became my goal in life. I continued my training with children with autism and it reminded me of my childhood and the happiness I felt successfully learning something new. When I offered strong reinforces to children, I could see the same happiness on their faces. I could see the joy in their eyes when the endless spinning of the bubble container was replaced with blowing bubbles; the feeding bottle was replaced with age-appropriate eating utensils, and temper tantrums were replaced with the ability to communicate. I have so much to say about how I started my journey with the foundation! I do not think a lifetime is enough to thank Tracy for all of her help. She changed the lives of these wonderful children. Without her help, these Cristi’s Outreach children would have not had a second chance and I would have not known how to help them. She is my role model. I have learned so much from her. I learned that a person is never as important as when they kneel down to help a child and I learned that the secret to happiness is not just doing what brings you joy, but doing what you must do with joy. We made it to year 2013, and as I look back on our journey, I see the happy children who got their childhood back and who now go to regular education schools. The emotions we experience when they come back to visit us and thank us are indescribable. Hearing them say “thank you” with their whole hearts is the biggest accomplishment of my life. 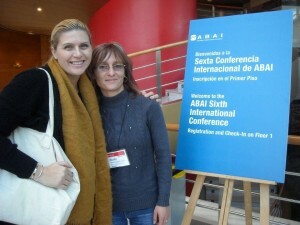 Top photo: Tracy and Nicoleta together at the Association for Behavior Analysis International’s (ABAI) 6th International Conference in Spain.